With water availability becoming more of an issue, the question of how much water vines need to consistently produce quality fruit year after year is more and more important. 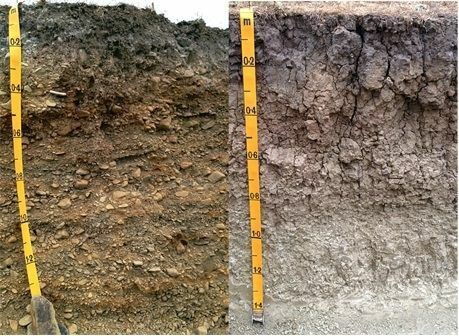 As soil has a large impact on water supply, a trial was set up in Waipara Valley, New Zealand, commercial vineyards to examine how Pinot noir vines growing in gravelly sandy loam (GSL) and clay loam (CL) soils responded to delivery of approximately half the normal amount of water through the growing season. During the 2014-2015 season (Sep-Apr), rainfall at GSL was 192mm with 135mm and 73mm irrigation applied for the control and reduced irrigation (RI) treatments, respectively. At CL rainfall was 181mm and irrigation 39mm (control) and 21mm (RI). Mid-season leaf area assessments showed slightly lower vine leaf area in RI, and Point Quadrat analysis showed that RI reduced leaf layer number (LLN) in both soils, though percent gaps was significantly increased only at GSL. However, by March there was considerable basal leaf yellowing and abscission, leading to a large change in fruit-zone canopy openness. Despite the changes to canopy structure, vine pruning weights and root carbohydrates were unaffected by RI. GSL had slightly more vigorous vines than at CL, with slightly higher canopy LLN and root carbohydrates, and almost double the vine pruning weights (per metre of row). Though the GSL soil held less water, the more frequent irrigation meant the vines could grow more than the vines on CL soil. The experiment suggests that vines cope with reduced water availability by slight reductions in leaf production early in the season, but as fruit ripening progresses, leaf abscission is the primary means of reducing the vine's water demand. However, there was no effect on overall vine pruning weights or carbohydrate storage.